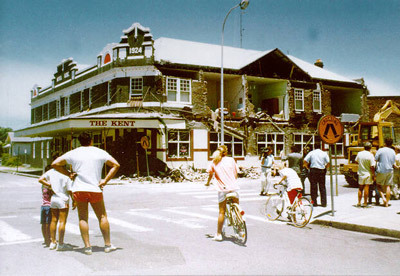 1897 May 10 Beachport (SA) 37.3 S 139.7 E 6.5 VIII Severe damage and extensive liquefaction in the epicentral area. About 250 km south of Adelaide. Minor damage in Adelaide. 1918 Jun 6 Gladstone (QLD) 23.5 S 152.5 E 6.0 VI Among the largest E. Australian earthquakes, and the largest according to a magnitude estimate of 6.3 which was based on felt area. Located 135 km offshore Gladstone. Felt area spanned Mackay (to Nth), Grafton NSW (to Sth) and Charleville (to Wst). Damage in Rockhampton region included fallen chimneys, cracks in walls, broken windows. Minor damage reported in Bundaberg area and Gladstone. MMI of VII and VIII were noted on Quaternary floodplain alluvium in the Rockhampton area (ie. similar ground shaking as Newcastle earthquake). 1941 Apr 29 Meeberie (WA) 26.8 S 116.1 E 7.2 VIII Largest onshore earthquake in Australia. Caused minor damage in Perth some 600 km distant. 1954 Feb 28 Adelaide (SA) 34.93 S 138.67 E 5.4 VIII Intensities MMI 5 to 6 in the central Adelaide area. Small area of MM 8 in the outer southern suburbs. $100M damage. 1960 Nov 11 Brisbane/Mt. Glorious (QLD) 27.33 S 152.83 E 5.0 - Mt Glorious earthquake - to the north of Brisbane. 1968 Oct 14 Meckering (WA) 31.6 S 117.0 E 6.9 IX Located 150 km east of Perth. Caused damage in Perth. 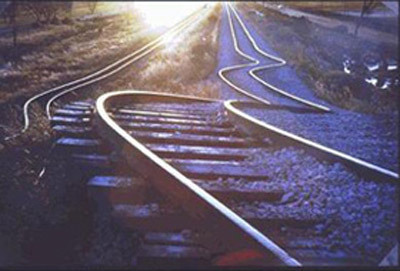 Fault trace of 35 km broke the earths surface (click here for an image - courtesy of Director AGSO) with up to 2m vertical offset which buckled railway lines, pipelines and roads. 20 million dollars damage. 1978 Nov 28 Heron Island (QLD) 23.34 S 152.52 E 5.2 IV Located to the east of Heron Island, Widely felt in Gladstone and along coast from Rockhampton to Maryborough. 1979 Jun 2 Cadoux (WA) 30.79 S 117.16 E 6.2 VIII Complex surface trace. Over 10 million dollars insured losses. 6.9 - Three earthquakes of magnitude above 6 in the same day. 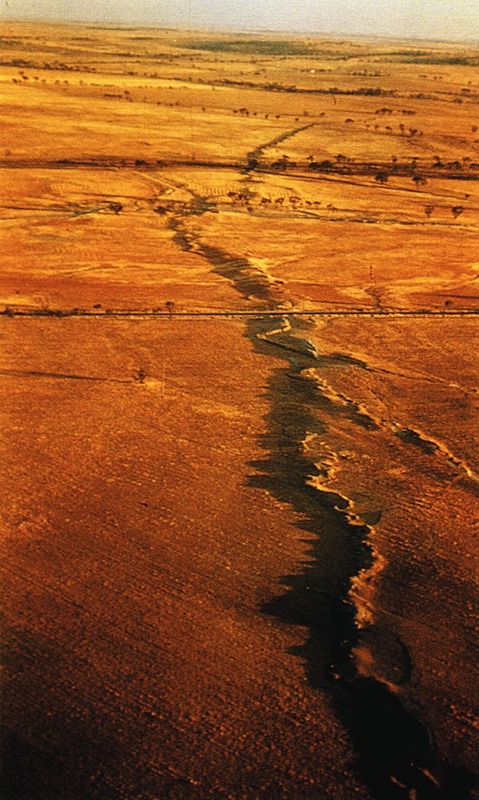 The Darwin-Alice Spring pipeline was shortened by a metre. 1989 Dec 28 Newcastle (NSW) 32.95 S 151.61 E 5.6 VII 13 deaths, 160 injuries, 60,000 buildings damaged, felt area of over 200,000 square km, about 4 billion dollars losses, 1186 million dollars insured losses (source ICA). 1994 Aug 06 Cessnok (NSW) 32.96 S 151.37 E 5.2 VII Over 35 million dollars insured losses. 1996 Jul 18 Brisbane (QLD) 27.59 S 153.04 E 2.9 IV Acacia Ridge. Located about 15 km south of Brisbane city. Widely felt from southern Brisbane suburbs to Logan City in the south. University switchboard jammed with incoming calls. 1998 Nov 2 Rockhampton (QLD) 22.81 S 151.15 E 4.7 - Widely felt on Heron Island (one person reportedly thrown from bed). Felt in Rockhampton.